Whether you are a small, medium, or large business with a branch or remote offices, storage worries should be the last thing on your mind. As you work with your large number of users, you need to accommodate their demands to store and access growing volumes of files such as business documents, images, audio files, and videos. You need efficient file storage that is secure, yet easy to manage. HPE is here to help. With the HPE StoreEasy—a new breed of optimized, efficient, secure, and highly available storage systems—you stand to gain a lot. 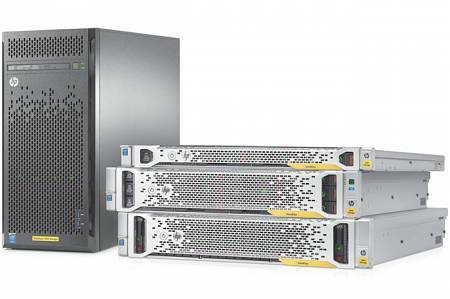 The HPE StoreEasy 1000 Storage family is designed for small businesses, branch offices, and workgroup environments. The HPE StoreEasy Storage family caters to your unique storage needs. They integrate easily into new and existing environments offering your storage administrators and IT generalists a straightforward, consistent management experience. With built-in security, your data remains well protected and available to your users when and where they want to access it. It also enables you to install and run endpoint protection such as antivirus on the system itself, reducing the cost and complexity of connecting an external endpoint protection server. With features including constant health monitoring, mirrored OS disks, advanced memory protection, reliable software support, and more, you can provide users with a highly available solution that keeps their data ready and highly available. Not to mention the support and expertise our highly skilled HPE certified professionals can offer. Powered by ProLiant DNA and Windows Storage Server 2016 or 2012 R2, HPE StoreEasy provides the tools and capabilities to help you get the most out of your capacity, spend less time managing storage, affordably and densely scale capacity as you grow, and seamlessly backup data to Microsoft Azure.